So, I’m going to ask you a question that is going to sound better suited for a college philosophy course than worship: Why are you here? I don’t mean in the big, existential sense of why are you alive, or here on earth, or why does any of this exist. I mean in a very simply sense: why are you here at church this morning? After all, you have other options, you know. You could be home, sleeping in right now. You could be out running errands at the grocery store or doing home repairs. You could be at brunch, sipping coffee and eating Eggs Benedict. You could be in so many places right now other than sitting in the pews at church on a three day weekend. And yet, you are here. Why? Now, don’t get me wrong…I’m glad you are and no one is asking you to leave. Far from it, because I hope you keep coming. But in this season after Epiphany, this time before Lent when we are still remembering the Light that just came into the world at Christmas, it’s as good a time as any to ask yourself that question: Why am I here? So, unless choice was taken out of the equation, and your parents brought you here today, take a moment to ask yourself that. Because in an age where no one goes to church simply because “everyone does it” anymore, you choose to come anyway. Something has brought you here today, even if you can’t exactly explain it. And so I’m going to ask you this question about why you are here a few different ways this morning. But before you answer that, let’s start with the Scriptures. I normally only preach on one text, but this morning we read two. The first is from the first book of Samuel, and it talks about a young prophet of the same name. He’s been taken to the temple and his life has been dedicated to serving there. And one night it’s growing dark, and he can’t see well, and he starts to fall asleep. And then there’s a voice: “Samuel, Samuel.” He runs to Eli, the priest he works for, but Eli tells him “I didn’t call…go back to bed.” Again, he starts to slip into sleep and hears, “Samuel!” He runs to Eli who tells him, “I didn’t call you this time either.” So he goes back. And then a third time, “Samuel, Samuel.” And this time Eli catches on. And he tells him, if you hear it again, say this, “Speak, God…for your servant is listening.” And God does. So, that’s the first story. The second comes from the New Testament, and the Gospel of John. In it, Jesus begins to call his disciples. He goes to a man named Philip and he calls to him and says, “follow me”. And he does. And then Philip goes to his friend Nathaniel, and he tells him all about Jesus, and even though Nathaniel doesn’t quite believe it, Philip tells him “come and see”. And he does, and he finds out that everything Philip said was true. Both stories are about calling. They are about God speaking to people who never expect to be spoken to by God. In Samuel’s case he hears God’s voice directly. In Philip’s he is called directly by Jesus. And in Nathaniel’s, it’s Philip that God uses to call to him. In the United Church of Christ, the wider church we are a part of, we have a saying. We say, “God is still speaking.” That means that God didn’t just speak to people like Samuel or Philip or thousands of years ago. God speaks to us today. And sometimes our job, as God’s people, is to learn to say, “speak God…for your servant is listening.” And, sometimes, our job is to drop everything when we hear Jesus saying “follow me”. And sometimes, it’s just to repeat God’s call and to tell the ones we love the most, “come and see”. So this leads me back to the question: Why are you here? First, why are YOU here? We each have our own answer to that question, but I believe each of us is here, in Christian community for a reason. Because just like Samuel, and Philip, and Nathaniel, I believe that God called you. I don’t know how God called you, but I believe God called you. First, God called you to God’s self. This was not a one time thing. God calls us to God over and over again, and even if we get off the path sometimes, God calls us back to God. You might not hear it the way Samuel did, with a literal voice in the night. You might hear it through the voices of friends. You might hear it in community. You might hear it whispered around you, like a gentle nudge. But however you hear the call, it’s real. And it’s valid. And even if you aren’t so sure what it’s saying, something about it was enough to get you out the door today and here this morning. And so here’s my next question: Why are you HERE? I don’t just mean here at the Congregational Church in Exeter. I mean here at any church. Because this is the era of “spiritual but not religious”. There are plenty of voices out there telling you that you can connect with God on a hike, or over brunch, or at a party with a bunch of friends. And I’m not saying that any of those things are false. But I am saying that I don’t think they are enough. Because at the end of the day, the solitary spiritual life is just that: solitary. And I don’t think God calls us out only to leave us alone. When Christ called Philip, he didn’t leave Philip alone for long. Right away Nathaniel was called too. And then more and more disciples. The church is here today because Christ knew we were better together, and for generations we Christians have discovered the same thing. And something about that appeals to you enough that you are here, in a church. That’s true for each of us here today. Each of us has come here on our journey, our roads converging together here. And now, as members of this community, we walk the road together. That’s why I am here. That’s why you are here. That’s why each of us is here. And so here’s the next big question: Why are WE here? Why have we been brought together in this place. Some of you read in my weekly email on Friday that today we are starting a new, month-long sermon series that will lead us right to the start of Lent by that same name: Why are WE here? And here’s the big question we are asking: What does it mean to be church together? What we are really asking here is “What’s our purpose? What are we all about?” And to answer that question, sometimes it’s easier to ask the opposite question: What isn’t our purpose? I have a few thoughts. These are reminders I have to give myself from time to time, because they are easy to default into, but I’ll share them with you because maybe they are helpful. First, the church is not a club. We may have members and membership rolls and a building and all of that, but we aren’t a club. This is a place where we each belong, but remember that this is also a place where anyone who wishes can also belong. There is no exclusivity here. Second, with all due respect to all the great civic organizations out there, we aren’t one of those either. We can do good works continuously, and we should and must, but at the end of the day if that’s all we do we may as well just pack it in and join together with all the great organizations out there who do good works everyday. And third, we are not just a place where we are fed, or entertained. Don’t get me wrong. I want us to leave church on Sundays filling spiritually renewed. I want the music to be uplifting, and the sermon to be memorable. But, I want those things to happen because we were worshipping God together. And because we are being prepared so that we can go back into a world that needs people who will lead lives that testify to God’s love. That’s true of everything we do together. We do not exist for ourselves. We exist for glorifying God, and for loving the world. All the things we do together, worship on Sunday, committee meetings on Wednesday, music rehearsals on Thursday, all of that is important because all of that is part of what it means to be the church, the body of Christ. And we, you and I and everyone else here, are the church together. Church is not a place we go on Sunday morning. Church is who we are. And we don’t have to be church alone. We are really, truly, better together. And our life together, no matter what comes up, can always be deeply joyful because of that fact. And so, over the next few weeks, in the course of worship, the most meaningful thing we do together, we will be exploring why we are here. We will be looking at three things that Christ calls us to do together: to learn, to change, and to love. I’m not saying that’s the sum of the Christian life, but those are good places to start. And along the way, I hope you will keep asking yourself the question: Why am I here? 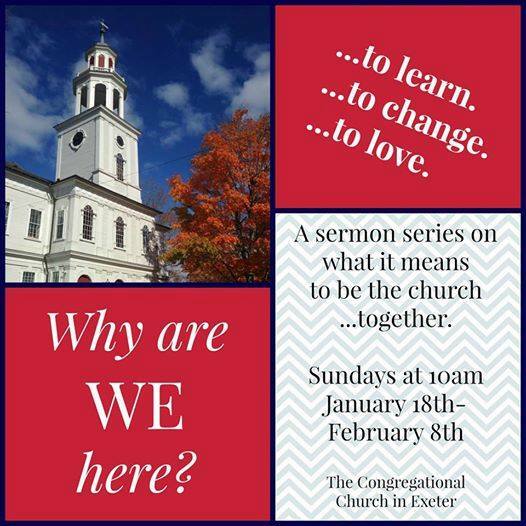 And I hope you’ll then ask the bigger question: And what does it mean that I am a part of this “WE” called the Congregational Church in Exeter. They are big questions, but they are worth asking. And more than anything, they are worth asking together. I’m privileged that my road has intersected with yours, and that we have found each other in this place. And I’m looking forward to asking them together. Amen. January 18, 2015 January 19, 2015 Emily C. Heathcalled by God, calling, Christ, Christian, Christian community, church, disciples, discipleship, ecclesiology, Eli, here I am Lord, Jesus, Jesus Christ, lectionary, Phillip, puirpose, Samuel, sermon, UCC, United Church of Christ, Why are we here? Next Next post: I don’t think I want to be a “Progressive Christian” anymore.